Well its been another week of busy craziness. Makenzie started the week off with a cold. She missed school on Monday but by Tuesday was ready go back. I am so thankful for her strong immune system, something that was quite weak before we did stem cell therapy. Despite being under the weather she had a great week at school. Friday her aide was out and her teacher was sick so we got to stay home again and cuddle all day! It was so nice to not have anything to do but spend the day with my girl not once but twice this week! I went in to the middle school at the beginning of the week to follow up on my conversation with the psychologist and found out they had my son on the calendar to be tested on January 10th. I was furious. They legally have 60 business days..... not just standard business days..... like 60 full days that the school is open. So take out fall break, Christmas break, and three days for Thanksgiving..... yeah. So doing the math on that one they legally have until the middle of January to do any testing and after that they have another 30 open business days to incorporate any modifications into the classroom. Doing more math..... that is almost the beginning of April...... school gets out in June. Our conversations did not go terribly wonderful and ended with me telling the psychologist I was disgusted with the fact that he would consider standing on policy before helping my son after ignoring his struggles for over a year. I also talked with the 8th grade dean which went about the same..... until I got a call the next morning to tell me that they would be completing the testing within the next 3 weeks. Thank You, thank you very much. I do not know what they will find but any information at this point would be helpful. After speaking with the private school a bit more this week I am not sure it will be an option for our family. They do not give full scholarships and coming up with $15,000 a year even after the largest scholarship they offer is not very realistic for me at this point. With that said I will gear up to battle with the school and continue to search for other options as well. I am one edit away from finishing my first research paper in 15 years. This is where I out myself as a nerd because I have to admit I had a ton of fun writing it. I am also getting ready to start the biggest paper in my English class and at this point my fears about whether or not I could be successful in going back to school while managing the rest of my life are all but gone. The schedule for next semester will be open for registration next week and I have decided to take 14 credits and officially go full time. I am sitting here trying to think of something else to write about Makenzie since this is technically her blog but I can't come up with anything. She is doing so well. She loves school, she is thriving and as always happy. God is SO good! Life is awesome, super busy, and totally blessed! Well the wheels have been turning around here. I have spent a good amount of time this week dealing with the public middle school and their lack of communication and unwillingness to help my son. After numerous conversations with several professionals at the school I am beginning to wonder if it is more about lack of knowledge then unwillingness. Frustrated does not even begin to describe my mood these days. So in true mama bear fashion I began to look into other options for my children. A plan B that would award them the opportunities to learn in an environment that is more conducive to their needs. On Wednesday I toured a private school that was AMAZING! Their class size is 10-12 students. They teach all 4 learning styles, the modify and teach to each students level but do not dumb down the content. This all comes with a 90% graduation to secondary education rate. I could give you the full novel version of my experience but it would be very long. The bottom line: It was wonderful and I know that my kids would thrive there. Of course there is always a catch 22 to most good things. For starters I mentioned that school is private. It is VERY pricey but they do offer scholarships. The application process is also long and tedious requiring a parent statement, child statement, and statements from two teachers. Te other thing they require from application submission is extensive cognitive and achievement testing to be done. After making several calls to psychologists the price range for this testing which is not covered by insurance is anywhere from $600-$1000 per child. Chump change..... or not! So I have been plugging away on the testing trying to find a cheaper way to go about it and today I hit the jackpot. I found a clinic that has a good sliding scale and will be able to get two of the boys tested for $500.00. God is good! They are not able to get us in until January but if this school is where God wants my kids to be I trust it will happen. However, for the remainder of this year I have one son that is very much struggling. The school has agreed to formal testing but they have sixty operation days to complete the testing and then another 30 days to implement any of their findings. If you do the math on that one it will be the first part of April before they would be legally obligated to "help" my child. "Oh you don't want to do that it would be very expensive." I looked him square in the eyes and said "I wont be paying for it you will." and then reminded him that under IDEA I had the right to a private second opinion at the districts expense. Moving right along to the " It sounds like you are angry." and to that I told him that he was grossly misunderstanding our conversation. I explained to him that I was not angry at all. I was a mom, sitting on his couch advocating for my child and explained that I would continue to do so until I felt like he was getting what he needed. Our little talk ended with him telling me to let him know when I had specific ideas on how they could assist my son better and he would do this best to make it happen. I am pretty sure he opened a box of worms he isn't prepared for. I am guessing when I get my list to him he will be wishing he had just thrown out some ideas instead of stonewalling me. Ready or not....... Here I come! Here is a video of Makenzie driving her power chair at recess this afternoon. I just loved to watch all of her friends play with Makenzie. She was so happy! So proud of my girl!!!! It is Sunday afternoon. I am sitting at the kitchen table in my pajamas helping Mr 15 do his homework. Ok so I am forcing him to do about 10 assignments that are now late in one class that he can not stand. Between picking up Makenzie's doll off the floor after she knocks it down and laughs and prodding my son along, I may finish my English paper. Mr 13 is off with a friend getting chilies so that they can make salsa and Mr 11 is playing on the computer. I love laid back Sunday afternoons. It really has been status quo around here this week. Not much new going on which I guess is a good thing. Makenzie had a GREAT week at school. I was able to get her power chair to school, train the staff, and adjust some of the switches. She rocked out! We are working on being able to keep her arm on the forward switch for smoother movement. Makenzie gets so excited when she makes her chair go that she lets go of the switch. Last week Makenzie made about 7 FULL laps around the school in close to continuous motion! I helped steer left and right and we also worked on stop and go on command. During the time she was in her chair she also managed not to run any of her friends over! She is also loving the trike. I also went into the school early last week to help with some positioning issues and to watch her movement more closely in the trike. By the time we were done she had rode across the school into the cafeteria, around the cafeteria, played a round of football with the nurse, and raced one of her buddies back to the classroom. Other then steering and a few prompts in the beginning, Makenzie propelled that trike all by herself. I also received two phone calls this week from Makenzie's aide to tell me that she had pitched a huge fit when told that it was time to put her trike and power chair away and go back to class. 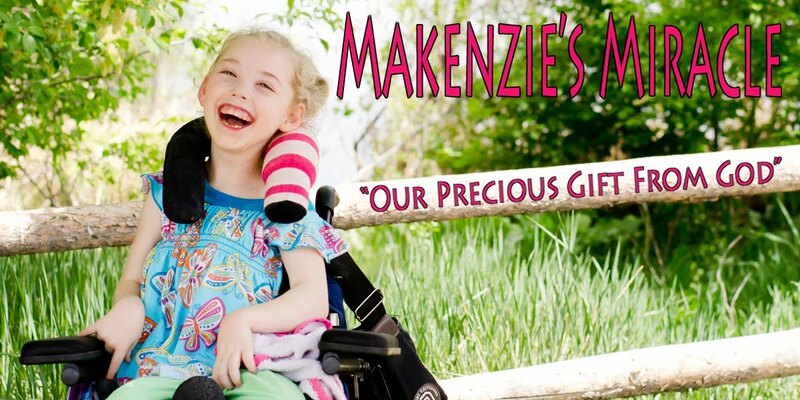 On the trike front, we also met with some really amazing people who are going to help fund a trike that Makenzie can call her own. Makenzie's PT and I took measurements and specked out the things she would need on her trike. We them sent all of the paperwork to be reviewed and I was told that Makenzie should have her own state of the art customized to her needs in the next couple of months! To say I am excited for her would be an understatement! Watching Makenzie become more independent over the last couple of months just makes my heart swell. Picking my girl up from school and seeing remnants of tears because she wasn't ready to leave or getting phone calls about temper tantrums is something 5 years ago I was not sure would ever happen again for Makenzie. It is now 2012 and Makenzie can throw a tantrum with the best of them. I am so proud of her and so thankful to my God for the healing he has brought to Makenzie's body! Being Makenzie's mommy is such a privilege and quit honestly a whole lot of fun. Well I am now off to get my son back on track. He has now been working on his 5 whole paragraph essay for the last.....oh forget it I have lost track....... and edit my paper one last time. Today is the day 15 years ago I became a mother. My now 15 year old son started high school this year. He has friends, is playing football, as of tonight he is pulling close to a 3.0 GPA and has officially starting saving for a car. I am so proud of my boy. I am having mixed feelings about my kids growing up. When they were born I thought about the future. I saw mom's at church with older kids and remember feeling like that day was SO far away. I carried my newborn around in his car seat all bundled up, stepped over hot wheels, bought batteries for the baby swing, but high school seemed like it was and would always be just a dream. Now it is here. The reality is, I am now the mom with older kids. I am so excited to see my son succeeding and becoming a man but at the same I am sad to think that in just 3 short years he will actually be a man and not my little boy. Life sure is a crazy thing!